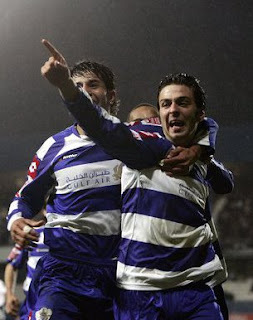 Ten-man QPR produced a memorable display after a stunning 1-0 win over Birmingham City, with a 25 yard screamer from Samuel Di Carmine on 54 minutes. I must apologise for the the extreme lateness of following up with this report, but unfortunately, I have had technical issues way beyond my control, which are still yet to be resolved, but I will plod on the best I can for now. Normal service will be resumed very soon. Well by now, I guess we have all read the papers, seen the goal on TV, the highlights on QPR world etc and those who were there, have probably thawed out by now. So, with that in mind, I won't give you my usual ramblings, except to say, that this game really did have everything - good football, a stunning goal, an abysmal referee, controversy and freak weather. But above all else, this was Rangers best performance of the season so far, fantastic! Fantastic is also a word that could be used to describe the Loftus Road crowd on the night, also. The only sour point of course, was Mikele Liegertwood's harsh red card. Incidentally, the appeal today was rejected and Mikele now faces a 4 match ban! But remember, referee Mr Attwell can do no wrong and he let most of the Birmingham Premier League prima donnas dictate to him all night long - which made the result even sweeter!! QPR: Cerny, Stewart, Hall, Leigertwood, Blackstock (Buzsaky 69), Rowlands, Connolly, Cook (Mahon 46), Tomassi, Ledesma, Di Carmine (Ephraim 74). Subs: Cole, Parejo. Lofty's Man of the Match - Cerny, Stewart and Tomassi were all awesome for QPR, but the pride, the heart, the passion, the commitment and desire shown by the team on Tuesday night, can only mean that this particular award goes to - Queens Park Rangers F.C. 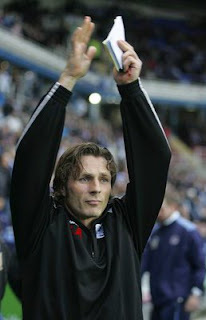 Gareth Ainsworth celebrated his first game in charge with a hard-fought and much deserved point at Reading in front of the Sky Sports cameras. It all started well enough though with the journey being a breeze and was probably, the easiest so far for PK and the Henley mob. But the Rangers travelling support couldn't really have asked for any more today. Without getting into a debate of who is picking the team etc etc, the players today did themselves and the club proud. There was still a little bit lacking from the R's in the final third but Buzsaky and Parejo brought good saves from Hahnemann in the Reading goal. Reading themselves had few chances and had a decent penalty shout turned away by referee Foy when Mahon clearly handled the ball in the area. Rangers had an appeal of their own late on, but to be honest, the dive from Parejo was so pathetic, I am surprised he wasn't shown a card for it. Why he chose to do that rather than put in a cross from what was a good position, I will never know? QPR: Cerny, Leigertwood, Stewart, Hall, Connolly, Buzsaky, Mahon, Rowlands, Cook, Di Carmine (Blackstock 60), Parejo (Balanta 86). Subs Not Used: Delaney, Tommasi, Cole. Lofty's Man of the Match - Damion Stewart had an awesome game in the centre of defence and incidentally was voted Sky's man of the match. Leigertwood looked extremely comfortable in the right back position, but today's award, deservedly goes to R's keeper, Radek Cerny. In summary, I am a lot happier now than I was yesterday. As mentioned, this was not only a very decent result but a fully deserved one. Reading were six out of six at home before today, scoring freely and we never really gave them a sniff at goal. Another tough test will come on Tuesday against Birmingham, but if Rangers show as much heart, passion and desire as they did at the Madjeski Stadium today, we will have little to complain about, whatever the result. Iain Dowie has today been sacked as QPR manager with Gareth Ainsworth taking over as caretaker manager for the trip to Reading on Saturday. Dowie has won eight of his 15 matches in charge of QPR but has recently attracted criticism for negative team selections and poor performances. It has been reported that Dowie has had many fall outs with owner Flavio Briatore – falling out with him in the summer when he was refused money to purchase a striker and then again after the draw with Blackpool over team selection and tactics. It has also been said that Briatore has become more hands on with team matters over the past week, something else that Dowie has had to contend with. Personally, I am furious and QPR are becoming a laughing stock! 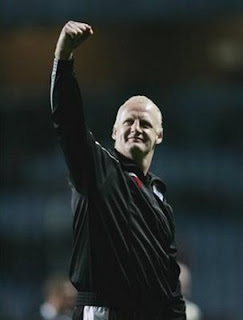 Good Luck Iain Dowie and thank you! You never really stood a chance! and Good Luck Gaz, your certainly going to need it!! QPR gained a decent point away at Swansea, but according to reports, were more than fortunate to get away with a draw in a game that saw the home side play nearly 70 minutes with a centre back in goal. Swansea maintained their unbeaten home record against Queens Park Rangers but had to do it with defender Alan Tate acting as a make-shift goalkeeper. 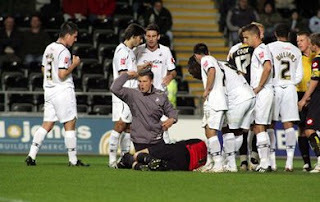 Stopper Dorus de Vries suffered a suspected broken jaw on 26 minutes after a challenge from Martin Rowlands that saw the QPR captain booked. With no replacement on the bench it meant Tate was handed the task of replacing the injured Dutchman. 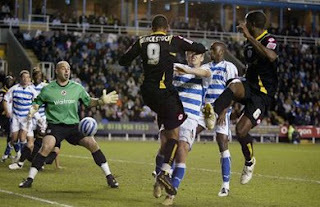 But QPR were unable to muster any real threat to test Tate between the sticks. We didn't play well, we didn't pass the ball well or retain it well enough. They've had an outfield player playing in goal and we haven't tested him at all and that is not good enough. For 70 minutes he's not done anything. But then we couldn't test him without the ball and Swansea moved it about well and made it difficult for us to get it back when we lost it. Martin's not that kind of player. The ball was there to be won but unfortunately he's caught him. We hope he makes a speedy recovery and wish him all the best. QPR: Cerny, Delaney, Stewart, Mahon, Hall, Leigertwood, Blackstock, Buzsaky, Rowlands (Parejo 59), Ramage (Connolly (80), Cook (Ledesma (65).Subs: Cole, Balanta. After the much welcome International break, QPR returned with a welcome three points in what was a narrow, but deserved victory at Loftus Road. Well, over the past few season, the gang of friends which have been very much an influence to what gets written on these pages, has dwindled somewhat for various reasons and many new friends have been happily found along the way. But today seemed very much like the old days as Paul, Darren and Billy returned to join us all and when we all met up at the Springbok before the game, it was like they had never been away. I only hope they continue to come back as the reunion continued at the British Queen after the game and a great time was certainly had by all! After a largely forgettable first half, Rangers went ahead three minutes after half-time when Fitz Hall's long throw was headed on by Damien Delaney and Balanta's volley went in off the underside of the bar. It was 2-0 on the hour mark and again a Hall throw proved to be Forest's undoing. This time the defender's delivery from the right was cleared only as far as Buzsaky, who fired home from the edge of the penalty area. The impressive Buzsaky sent another cracking shot inches over, before Cerny tipped away Nathan Tyson's 25-yard drive. Rangers at least kept loyal to one of their unfortunate traditions as Lewis McGugan pulled a goal back for Forest with a brilliant 30-yard free-kick, which made it an unnecessary, nervy final seven minutes. QPR: Cerny, Delaney, Stewart, Hall (Connolly 64), Leigertwood, Blackstock, Buzsaky (Mahon 90), Rowlands, Ramage, Cook, Balanta (Di Carmine 75). Subs: Camp, Ledesma. Lofty's Man of the Match - 2 main contenders today, with the superb Buzsaky being one of them, but today's award goes to Fitz Hall, as depite leaving the game on 64 minutes, had in my opinion, his best game in a R's shirt to date. Birmingham moved to the top of the Championship after a narrow 1-0 win over QPR, in what was a disappointing display from Iain Dowie's men in front of the Sky Sports cameras. As mentioned, with the game being the lunchtime Sky offering, it meant an early start for myself and PK for what is a relatively easy away trip. Not so easy however, for the Henley mob who, after leaving their directions at home, had to follow us into Birmingham from Warwick Services. We arrived in plenty of time and after meeting up with the Leeds three, decided on a pre match at the local Subway after having discount vouchers literally thrown at us as we got out of the car and also, seeing as pubs are a bit of a no no around Birmingham. Kevin Phillips grabbed his fourth goal of the season as Birmingham beat QPR to move top of the Championship. The first half had lacked any serious goal threat until Phillips prodded in from close range just before the break. 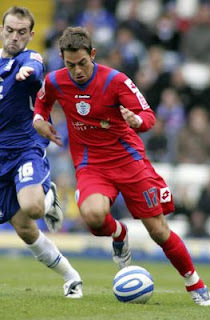 QPR failed to muster any signs of being able to get an equaliser as the Blues defence comfortably held them at bay. Birmingham were not at their best but the lack of ideas and urgency from QPR rarely troubled them as they secured a seventh win in 10 league games. Not a bad summary, but I was actually pretty pleased with the R's first half performance and we certainly didn't deserve to be behind. Just before the break, Garry O'Connor latched on to the ball, evaded a somewhat half hearted tackle from Fitz Hall and put in a low cross which Phillips converted from close range. Onto the second half and after containing Birmingham so well in the first, being behind would surely enforce the R's to come out and adopt a more attacking style and go for it - but it just did not materialise as Birmingham defended their slender advantage. Lofty's Man of the Match - Lee Cook - involved with everything that was good about QPR today and almost single handedly tried to breath some life into QPR this afternoon. A late Dexter Blackstock goal denied Blackpool another away win as Rangers stuttering form sadly continued at Loftus Road last night. Apologies for the lateness of this round up, but on arriving back late last night, it wasn't really the time to write this one up, mainly, because I was angry!! Good in some ways that I have left it until now, but with so many changes already and happening at QPR this season, some things just never change. Rangers have followed up three good away performances, including the superb win at Villa, with two stuttering home showings. Much has been said of the 4-5-1 formation that Iain Dowie seems to be favouring this term. When it works, it looks fantastic, but when it doesn't, it looks a complete shambles. So much so, the team were firmly booed from the field at half time, trailing to Gary Taylor-Fletcher's stunning 25-yard effort that looped over Radek Cerny. Thankfully, Dowie shuffled the pack at half time and went 4-4-2, with Agyemang joining Blackstock up front. Liegertwood also joined the proceedings at the expense of the inneffective Parejo and Ledesma. Rangers looked so much better from there on but found the Blackpool rear guard holding firm. Lee Cook's low drive was tipped behind by Paul Rachubka before Blackstock's header was ruled out for pushing. Akos Buszaky joined the game for the last twenty minutes and made an almost immediate impact as his free-kick cracked the crossbar on 79 minutes - Dexter Blackstock was on hand to nod home the rebound to bring the R's level. QPR: Cerny, Delaney, Stewart, Mahon (Buzsaky 72), Hall, Parejo (Leigertwood 46), Blackstock, Rowlands, Ramage, Cook, Ledesma (Agyemang 46).Subs: Camp, Gorkss. Lofty's Man of the Match - Lee Cook, getting fitter all the time and almost back to his best! Well done Cookie! Finally, great to see Corp at the game again last night as he continues his recovery from illness. You seriously must be wondering what we have all be going on about, eh mate? And last but not least, a belated Happy Birthday to PK who was... (how old mate?) yesterday! !